We're super excited to announce the release of JIRA Service Desk 3, a fully standalone product purpose-built for service management teams. From our humble beginnings two years ago as a marketplace add-on for JIRA to the standalone product we are today, this release marks a huge milestone for us. With this release and beyond, our team is committed to addressing the needs of the IT and service management market. JIRA Service Desk 3 brings you a new project-centric navigation experience, out of the box project templates targeted to IT service teams, improved agent workflows, simplified notifications, and more. Or upgrade your existing JIRA Service Desk application. This is a minor feature improvement and bug fix release, and bundles a completely overhauled Application Links experience that comes with built-in diagnostics and link status lozenges. Now you can see what’s going on with your integrations and easily get the troubleshooting information you need to resolve any broken links. Read more about Application Links diagnostics. To manage access to your service desk projects, you can assign groups or individual users to project roles (e.g. Service Desk Team). Note that we have removed the Collaborator project role from all new service desk projects created in JIRA Service Desk 3. Now, when you wish to have another JIRA application user, such as a JIRA Software developer, work on service desk requests in a specific project, you can simply add that user to the project's Service Desk Team role. Any user who is added to the Service Desk Team role but does not consume an agent license will see a restricted view of the service desk projects with which they're involved. Learn more about managing users here. If you're migrating projects from an earlier version of JIRA Service Desk, and you have previously added users as collaborators, you will still see the Collaborators project role. If you would like these users to act as fully licensed agents on service desk projects, add them to the service-desk-users group and the Service Desk Team role. If these users only need limited access to help other agents resolve customer requests, move them from the Collaborators to the Service Desk Team project role. You can now manage agent access to service desk projects with the new Service Desk Agent project permission, which was previously a global permission. This project permission must be assigned to agents who need access to all agent functionality in service desk projects. Without this project permission, agents will see the restricted project view that other JIRA application users in the Service Desk Team role see. You can now separately assign the Edit Issue project permission to control which issues in a project agents can and cannot work on. 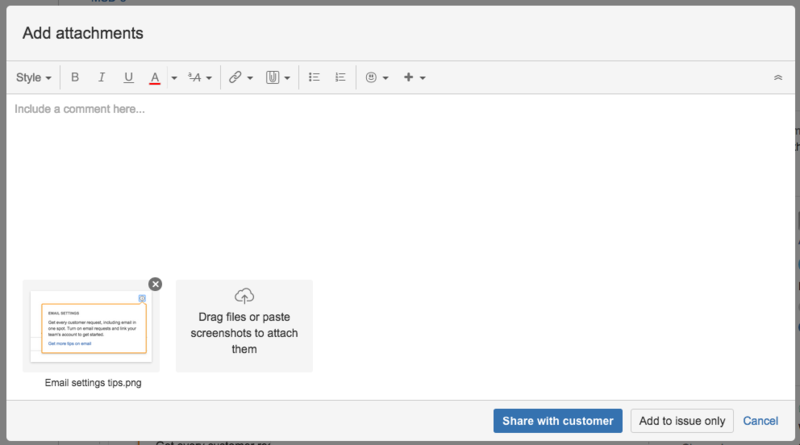 Agents no longer need to worry about remembering wiki markup to send attachments to customers. Agents can now drag and drop attachments directly, or select More > Attach files on service desk issues. When adding an attachment, agents will have the option to share it with the customer or to restrict it to internal users (e.g. other agents or JIRA application users). Agents can also add attachments when commenting on an issue by selecting in the comment toolbar. When you create a new project from the Projects dropdown menu, you can now select the new IT Service Desk project template. This template provides more default request types, request type groups, reports and queues (e.g. Change > Newly approved) for IT teams focused on incident management. 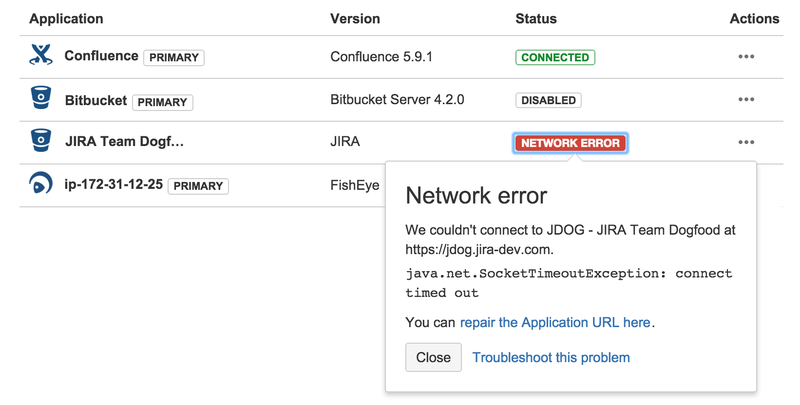 Learn more about using JIRA Service Desk for IT teams here. You and your team of agents can view queues, reports, the customer portal, and your list of service desk customers directly from the project sidebar. You can also add shortcuts to global boards if you previously used JIRA Agile boards with JIRA Service Desk projects. Configure project request types, users, SLAs, automation rules, and more, by selecting Project administration. Minimize the sidebar by selecting at any time. For JIRA Service Desk 3, we've simplified the previous email notification template, reduced the total number of email notifications sent to people involved with a service desk request, and made the email notifications more conversational. We've also added a few smarts to make JIRA Service Desk pre-populate the comment section of an issue when an agent responds to a customer. The pre-populated text can be removed or edited as required in the comment. As a JIRA Service Desk administrator, you will see a new Welcome guide in your project sidebar. The guide will lead you through the first few configuration steps of your new project. You can dismiss the guide in the upper righthand corner to permanently remove it from your project. JIRA Service Desk 3 is compatible with version 7 or later of the JIRA platform. Please check the full list of Supported platforms and refer to Upgrading JIRA applications before upgrading to the magic that is JIRA Service Desk 3.